Internet has been accessible easily in Nepal, which has increased the internet users in Nepal. Internet has increased lots of possibilities in Nepal. It has made life easier as well as work done faster with less effort. On increase in use of internet online payment has been introduced in Nepal and and has been accessible by public easily. Online payment has been making life easy in Nepal. Now we don't need to go for out for recharge and stand in queue for payment of electricity bill and telephone and internet bills. Currently large number of peoples are using these services to perform cashless transaction in Nepal. These services are provided by many online portal websites in Nepal. It is the first online payment portal of Nepal. Using esewa you can recharge mobile numbers, pay landline bills, pay internet bills, book airlines ticket, book bus tickets, books movies ticket, pay electricity bills, online shopping bills, school fees, college fees, insurance premium and many more. It is developed by F1 Soft Company. You can transfer funds to other esewa users or partner bank. It available on Android and iOS. You can transfer funds to your esewa account through esewa merchants or directly from your bank accounts. It is also an online payment portal for cashless transaction in Nepal. It is similar to esewa providing services to recharge, pay bills and book tickets. Fund can be transferred to your Khalti Digital Wallet from several banks and agents. It is owned by Sparrow Pay Pvt. Ltd. It is developed by muncha.com. 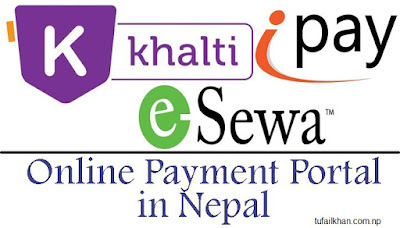 It is also one of used online payment portal for digital payment to perform online payment in Nepal, similar to above it also provides services for payment bills and to recharge your mobile phones. You can transfer fund to your account from partner banks and other iPay users. It uses 128-bit SSL encryption to secure your information. You can pay to insurance companies, school fees, college fees and more. Note: These apps are developing rapidly adding more services for public.